Within the cyclical category, resources stocks are beginning to show signs of dividend growth, while financials’ dividend growth is beginning to look static. There has been a changing of the guard. This has been the best reporting seasons since 2010 when measured by the ratio of positive earnings revisions to negative earnings revisions. The local share market also saw strong dividend growth of 3.5 per cent over the prior results in 2017. However, what’s a little different is that distribution growth is coming from a different part of the market. 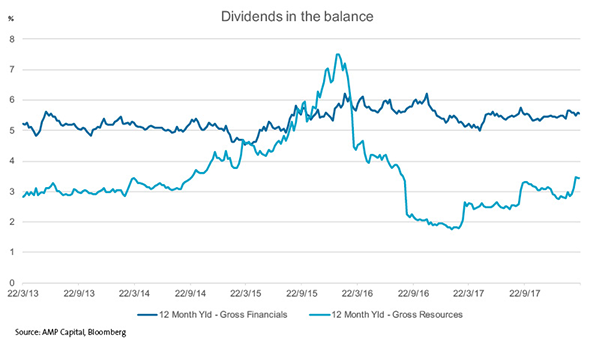 Previously, financials have been leading dividend growth. Financials are now holding their dividends and we’re seeing a number of cyclical sectors, namely energy and resources, increasing their dividends. This trend is stronger than perhaps the above chart suggests, considering bank shares have risen steadily as their dividends have grown in recent years. 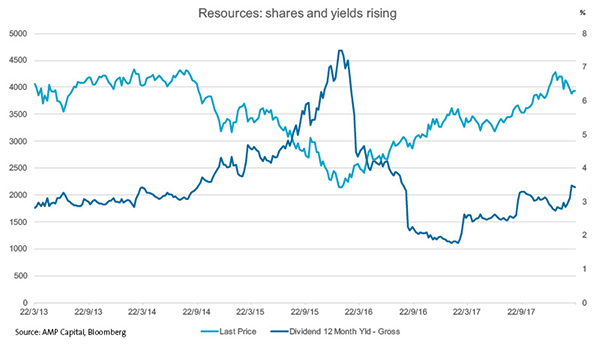 Shares in resources companies have been rising in recent months as investors begin to focus on names within this segment but the dividend growth within this segment is still apparent. Overall, the most recent earnings season was a bit of a pivotal time for investors, Coming to the end of a multi-year bull market, valuations are at multi year highs and we now are now about to start seeing interest rates tighten overseas. At the moment the market really likes growth stocks, but in that space we’ve seen growth stocks as expensive as they’ve been for over a decade. If you are expensive, you’ve got to deliver and that was something we saw this earnings season, Investors seeking income producing stocks should be looking for sustainable dividend producers.